bookSLEEPer is the story of an undeclared college student who isn't doing so well in school. With finals coming up, she decides to spend her reading week studying. When she accidentally falls asleep on a textbook, she discovers that she can enter the world of a book when she sleeps on it. Will our protagonist forge friendships, or even romances, as she explores these books? Will she pass her exams, or will she drop out of college and become a cat lady? The choice is yours! 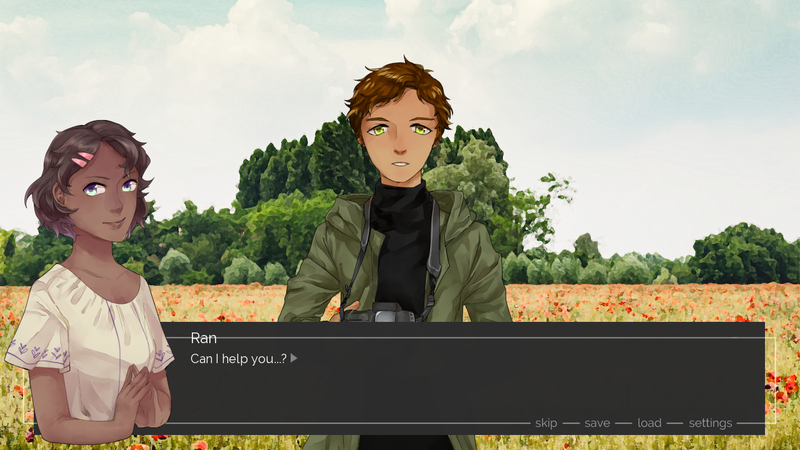 BookSLEEPer, a visual novel demo released for NaNoRenO 2017, currently contains four routes: English, Photography, Microbiology, and Philosophy. 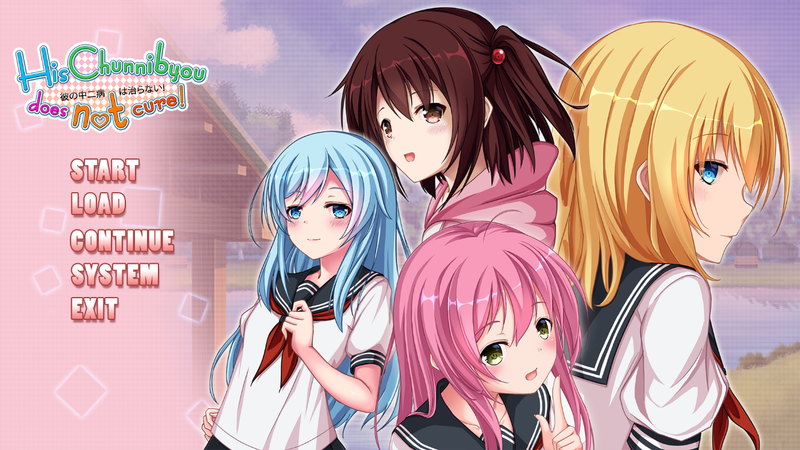 However, the NaNo version isn't complete yet, so it should be considered a demo of sorts. For this review, I took the microbiology route, since it's the only complete route so far. However, I did dip into the other routes a bit, just to see how it's like. Basically, the story goes like this: whatever book you last read before you sleep, you dream about it. So if the last book you choose to read was "The Taming of the Shrew", you'll find yourself dreaming about being in the book. If it was "Fundamentals of Microbiology", then you'll find yourself with Curie and Pasteur in the laboratory. Man, oh man. If only we could do this in real life, I'd probably be sleeping night after night right after reading manga or something. The concept is actually rather simple, but I really enjoyed it for the 'time travel' feels that it gives. I've always loved time travel stories, actually. 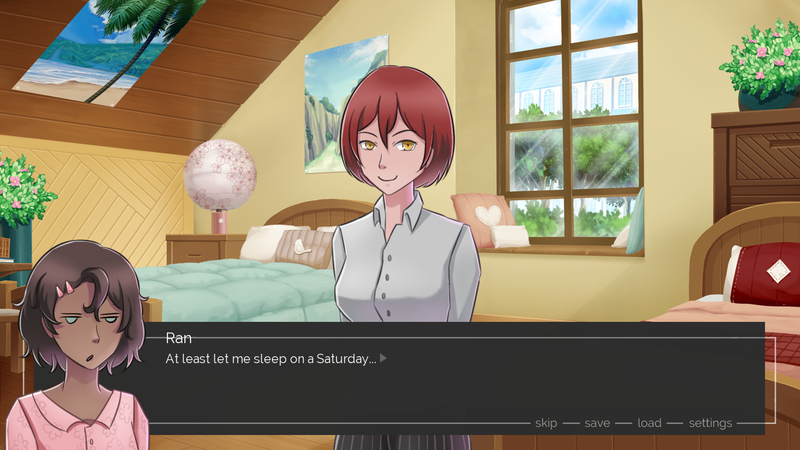 While BookSLEEPer isn't actually focused on time-traveling, it does become a part of the game as most of the things that happen in our character's sleep are things that have already happened in the past, fictional or otherwise. In the English route, we see the story of William Shakespeare's The Taming of the Shrew unfold right before our very eyes. 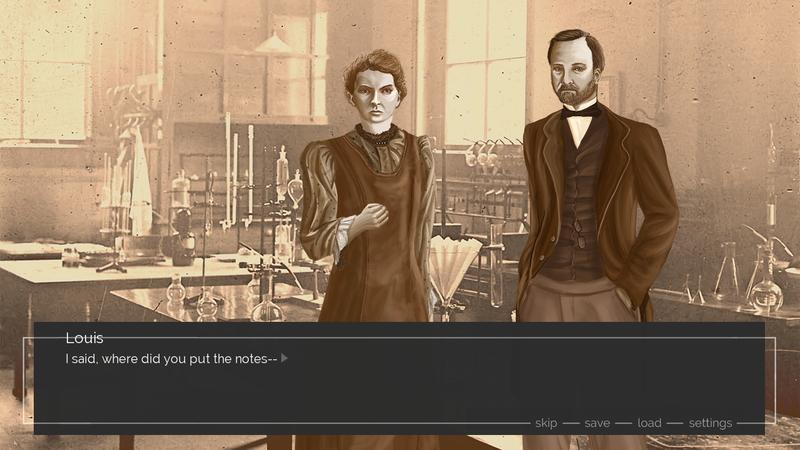 In the Microbiology route, we get thrown into the lives of Marie Curie and Louis Pasteur as they discover new medicine. In the Philosophy route, we meet the characters of Herman Hesse's famous novel Demian. In the Photography route, we get to see how the fictional photographer, Luca Hylton, captures each of his beautiful photos. I have to admit that my favorite route is the English route. The interactions between my character and Bianca from The Taming of the Shrew were both amusing and touching. 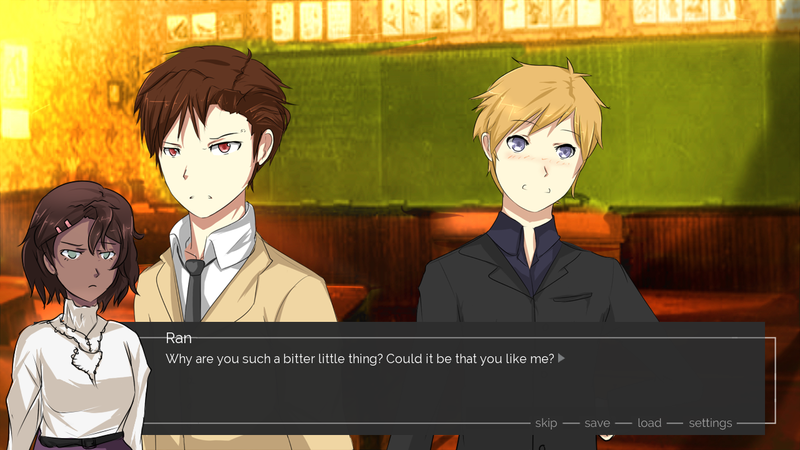 I also loved the dialogues in this route, more than any of the other routes. My second favorite is the Philosophy route. I love the dynamics between Demian and the MC! This route is still incomplete, but I'm looking forward to see how it'll turn out. Surprisingly, even though the Microbiology route is actually the only complete route, it's actually the one that I least liked. I'm quite excited for the final release, if only to see how the other routes will turn out. 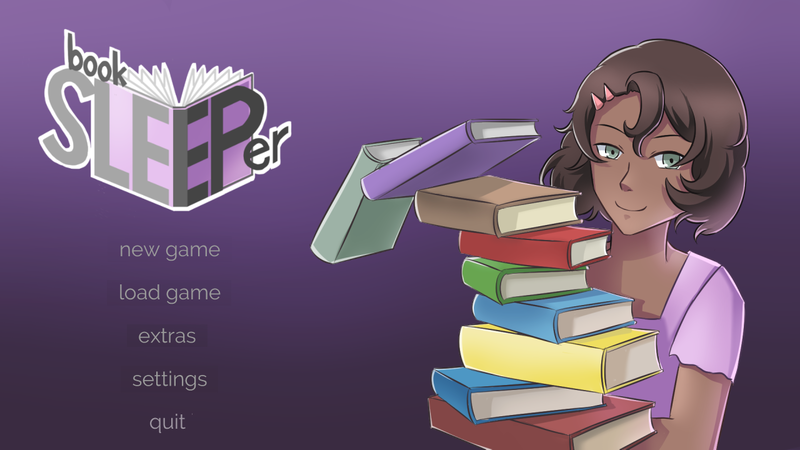 According to the itch.io page, BookSLEEPer actually has different writers per route. I guess that explains why the writing styles are all sort of different? Like I said, while I greatly enjoyed the humor in the English route, the scenes in the Microbiology route weren't nearly as interesting to me. As for the other routes, well, I'm also very interested in the Philosophy route, thanks to the dialogues between the characters. The Photography route was pretty nice, too, even though at times it felt more like I was just reading about photography lessons. 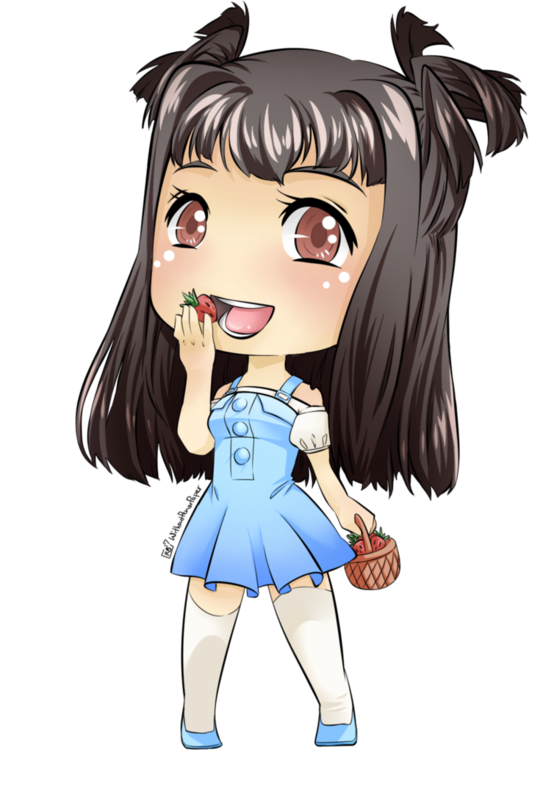 Regardless of my personal preferences, however, the writing quality is high in all of the routes, with minimal typos and errors. Actually, come to think of it, I don't think I came across a single typo. Pretty good, considering its length. I just have to say, the sudden change in art styles between the different scenes was pretty jarring. Since I first tried out the Microbiology route, this jump from one art style to another was even more pronounced for me. I mean, seriously. Look at it. I was really surprised when the art styles of, well, practically everything, changed. Not that it's a bad thing, I guess. It was just too sudden for me, to think that the art styles were completely-- and I mean completely-- different. 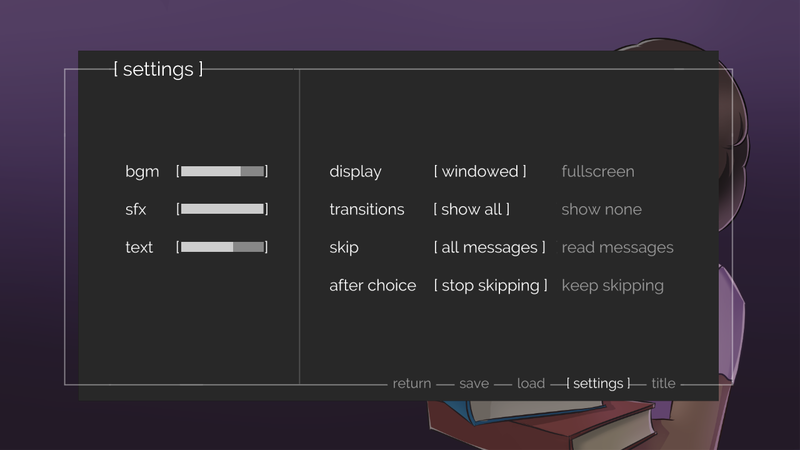 The GUI itself was pretty okay. It's custom, but basic. I guess so that it doesn't fit into any specific theme? Since the game does have four different stories, after all. My only gripe in the technical aspect has something to do with the transitions-- or rather, the lack thereof. It was very disconcerting. I believe the music used here isn't final yet, but that's understandable since it's still just a demo, after all. I did like the music in the MC's room, though, especially the night-time theme. Sound effects were pretty much limited to MC's alarm clock going off in the morning. Each route has its own story, and each one is pretty long, so I would say that there's a lot of replayability here. It almost feels like you have four different stories in one big story, which I really liked. If you'd like to give this a try, you certainly can, but I would recommend waiting until the final game is out. You can download this demo here.